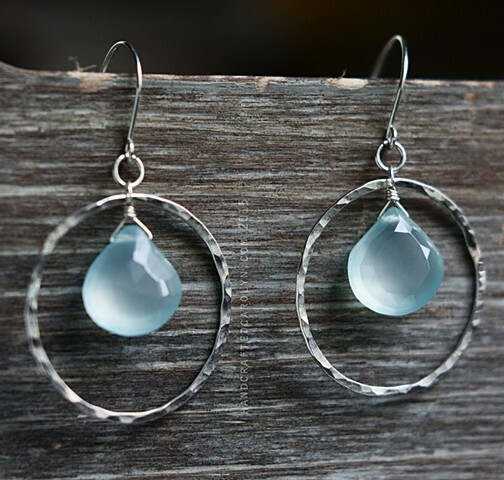 Sweet blue-green drops of chalcedony, a translucent semi precious gem, hang in the center of hammered silver hoops, handmade and forged by me! Earwires are 22g sterling silver wire and also made by me. These are light, and about 1.25 inches from the bottom of the earwire. Please note that colors vary with each individual monitor and the color settings on your individual computer. These stones vary naturally from very blue to green blue. These items are Made to Order. Please allow 1-2 weeks for notification of shipment.